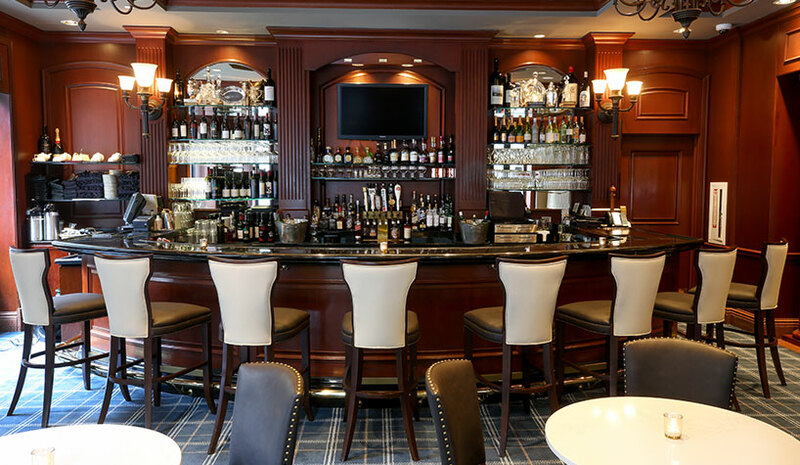 Located at the Omni San Francisco Hotel, Bob’s Steak & Chop House has completed a renovation that celebrates the location’s heritage in the Financial District. Recognized as California Historic Landmark 89, the restaurant is the former home of San Francisco’s banks and financial institutions dating back to 1852. San Francisco memorabilia, vintage banking photography, equestrian art and wine country artifacts that celebrate the city’s history and lifestyle are showcased throughout the steakhouse. Central to the dining room is a new Heritage Wall that pays homage to San Francisco’s history of grand celebrations and love of leisurely pursuits. Photos and artifacts pertaining to famous events, horse racing and winemaking are set against a platinum panel. The final phases of the multi-year, $25-million transformation of the Hilton Chicago/Oakbrook Hills Resort and Conference Center are now complete. The Prospera Hospitality-managed property has created a new vision and identity centered on modern design and resort culture. Led by Chicago-based architectural firm, O’Kelly + Kasprak, the modern mid-century-influenced design is themed throughout the resort, from the public spaces to the guestrooms. Complete design transformations have been done to the following areas: lobby, rotunda, all 42,500 sq. ft. of IACC conference center meeting space, including the grand ballroom and 36 meeting rooms, amphitheater, executive lounge, indoor/outdoor pools, Fitness Health Wellness Center, Willow Crest GC Learning and Performance Center, Monarch Spa, themed gastro pub “Tin Cup” and signature farm to table restaurant, B. Four Seasons Hotel Atlanta has renovated its guestrooms, suites, spa and fitness center and an outdoor event space. The hotel has partnered with New York-based interior design company, Meyer Davis Studio, for the refresh. A portion of the room upgrades were completed in 2015, and now all 244 guestrooms, including 18 suites and five new terrace suites, have been updated. The artwork in the guestrooms, suites and corridors was sourced from Canvas Art Consultants in Atlanta. Four Seasons Hotel Atlanta’s 50th floor Penthouse Ballroom, which was renovated in 2015 and has the same modern feel as the refreshed guestrooms, now ties in with the hotel’s Fifth Floor Terrace—one of two outdoor event spaces at the hotel. The 7,000-sq.-ft. space now has a louvered pergola for outdoor weddings, parties and other events. JW Marriott Houston by The Galleria has revealed new renovations to its meeting and events space. The new design reflects the city’s history, culture and modern style, pulling together visual elements to create a space that is reflective of Houston’s persona. Carpet designs are reminiscent of fine wool. The space has modern textiles, local artwork and rich and varied materials including leather and metals. The hotel also has renovated guestrooms inspired by the same design elements used throughout its contemporary spaces. SpringHill Suites Miami Downtown/Medical Center has completed a $2.9-million renovation, which included a complete redesign of the property’s guestrooms and public spaces. The hotel’s renovated accommodations are 25% larger than traditional hotel rooms and have a contemporary color palette and custom furnishings. The transformed lobby has new seating, lighting and artwork that lends an air of urban style to the space, along with modern lounge chairs, couches and tables.